Khensur Rinpoche Lama Lhundrup, who passed away on September 7, with Lama Zopa Rinpoche, Kopan Monastery, Nepal, June 2011. Gendun Drubpa Study Group Becomes a Center! 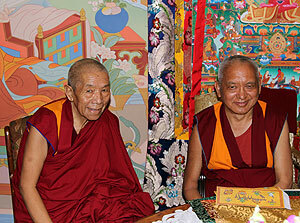 Geshe Jampa Gyaltsen and Geshe Sherab with Lama Zopa Rinpoche at Kopan Monastery, Nepal, June 2011. “On September 5, Rinpoche leaned very close to Lama Lhundrup to better hear his voice; it was very soft, a very soft whisper. ‘Even the very smallest pleasure is in the nature of suffering,’ said Lama Lhundrup. ‘If I have to go to the hell realms may I be able to take on all their suffering, may it ripen on me.’ The atmosphere was very, very still and calm. The conversation felt so intimate between too old close friends. There was no emotion – it was just a close and intimate exchange. … Later that morning Jo was called up to Rinpoche’s room. Rinpoche asked what was happening. Jo explained that Lama Lhundrup was refusing medication and food. Rinpoche sent a message to Lama Lhundrup saying, ‘Regardless of what you do – take medicine or not take medicine, take food or not take food – death will come regardless, so please accept the medicine and food and be relaxed.’ As soon as Lama Lhundrup got this message he immediately accepted, took the food and medication and seemed to be much more relaxed. That evening, September 7 (Tibetan 10), just after 11 p.m., while the whole monastery was doing Heruka Lama Chöpa dedicated to Lama Lhundrup, Sangpo and Geshe Jangchub went to Lama Lhundrup’s room to make a money offering from the puja. When they went in the room it appeared that Lama Lhundrup had passed away, as he was not breathing. They immediately left to let Rinpoche know. Straight away Kunkhen went in quietly. On closer investigation, and at that very moment, he saw Lama Lhundrup take his last breath. … The cremation was today, Monday, September 12 at 3:30 p.m.
Front: Khadro-la, Lama Zopa Rinpoche and Ven. Ngawang Samten (Rinpoche’s sister). Back: Surendra (famous thangka painter) and Sangye (Rinpoche’s brother) in Kopan Monastery, Nepal, June 2011. A student wrote to Rinpoche that she was desperate because she had lost her job and wasn’t able to find another one and therefore didn’t have enough money to pay for school for her children or house bills. Her husband didn’t earn enough to cover everything and now his health was being affected, so she was asking Rinpoche what she should do. Thank you very much for your kind letter. I am sorry you have been experiencing such great difficulties, but of course this is great liberation compared to the sufferings of the lower realm beings such as hell beings, hungry ghosts and animals. To be a human being having the opportunity to practice Dharma, to receive a perfect human rebirth, is extremely rare. Even to just receive a human rebirth is extremely rare and came from practicing morality in the past. So you can understand how rare it is. It is good to look at all the difficulties which humans are experiencing in the world – examine them, relating to yourself, all the incredible hardships, sufferings and problems. Then look at your life, how really rare it is, most rare, to find a perfect human rebirth. Buddha explained in the teachings that the number of sentient beings who are born in the hell realms in one second is equal to the number of dust particles there are on the earth. Then the number of sentient beings that get born as a hungry ghost in one second is equal to the amount of sand grains of the Pacific Ocean. Then the number of sentient beings born as an animal in one second is equal to the number of blades of grass in this world. The number of sentient beings born as a human being, or in a higher rebirth, is equal to the amount of earth that gets under the tip of your nail when you scratch the ground. It is very little. Then even more rare than that is to have a perfect human rebirth qualified with the 10 richnesses. Then to have met the Buddhadharma is extremely difficult. Then to have met the virtuous friend who reveals the perfect path to enlightenment is extremely rare. Then to have the opportunity to practice the Dharma which leads you to be free from the oceans of samsaric sufferings – can you imagine that, how rare that is? It’s most amazing. Then to have the opportunity to be able to achieve enlightenment for sentient beings by practicing the Mahayana teachings so that one can liberate numberless hell beings, hungry ghosts, animals, human beings, suras and asuras from the oceans of samsaric sufferings – and not only that, but bring every one of them to full enlightenment – can you imagine this? You have the most unbelievable opportunity. Not only that, you have much more than that because Buddha revealed the secret tantra teachings so that we can achieve enlightenment in one brief lifetime. This means that by practicing tantra one can achieve enlightenment in one lifetime, rather than in three countless eons. You are able to practice tantra, able to achieve enlightenment within in one lifetime, in a brief lifetime of this degenerate time. Therefore, what I am telling you is that what you have now is like liberation. You need to be aware of this. Compare your situation to the sufferings of the lower realms, to the sufferings of hell beings, hungry ghosts, animals, not to mention that of human beings who are experiencing worse suffering than you, who are much worse off than you. You can’t imagine what it’d be like if you were reborn as a preta or animal. You wouldn’t have the opportunity to practice Dharma. You can’t imagine what the suffering would be. Or if you were born in hell, you can’t imagine how much inconceivable suffering you would experience. So please rejoice that you are a human being, and not only that, but you have a perfect human rebirth. You have all these unbelievable opportunities, so please rejoice many times a day! You have the opportunity to practice Dharma; you have not been reborn in the lower realms. This is the most important thing. This is more important than being worried about not having money. This is the immediate thing to be worried about right away because death can come at any time. Regarding your situation, I suggest that you chant certain mantras, but when you do this, make sure your motivation is NOT just for your own happiness or for this life. If you recite with that motivation or attitude, then it doesn’t even become Dharma. In fact, it becomes negative karma. Even though the subject is Dharma the result is rebirth in the lower realms. So generate the correct motivation by thinking that the purpose of my life is to serve others, to benefit all sentient beings, to free numberless hell beings from the oceans of samsaric suffering and bring them to full enlightenment. Then think: it is the same for the numberless hungry ghosts, animals, human beings, suras, asuras and intermediate state beings, therefore, I must achieve enlightenment. Therefore, I am going to recite these mantras for success so that I can be able to help all the sentient beings who have financial problems, which includes your husband. After that motivation then chant the mantras. Due to all the three times merits collected by myself, numberless sentient beings and the three times buddhas, may bodhichitta, which is the source of all my happiness and success and cause of happiness of all sentient beings, may it be generated in my mind without delay, and what has already been generated, may it increase forever more. Due to all the three times merits collected by myself, numberless sentient beings and the three times buddhas, which exist but do not exist from their own side, being totally empty, may the I who exists but does not exist from its own side, being totally empty, achieve Guru Buddha’s enlightenment, which exists but does not exist from its own side, being totally empty, and lead all the sentient beings to Guru Buddha’s enlightenment, which exists but does not exist from its own side, being totally empty, by myself alone, who exists but does not exist from its own side, being totally empty. Due to all the three times merits collected by myself, numberless sentient beings and the three times buddhas, may I become wish-fulfilling for all sentient beings and bring them only happiness – instantly – just by them seeing me, touching me, remembering me and so forth. I hope you can understand that it is very important not to just simply recite these mantras for your own happiness. The most important thing to do is to generate bodhichitta, to remember that your life is to serve other beings, to benefit all beings and to free all beings from the oceans of samsara. Have a look at the new Lama Zopa Rinpoche Videos webpage, with many new videos available! Basic Program: This August the BP Final Exam was passed with flying colors by a member of Chenrezig Institute’s Nuns Community and Chenrezig Institute’s interpreter. They hope to graduate in February next year after completing their retreat requirement. Two more students should join them at that time as graduates of Chenrezig Institute’s third round of the FPMT Basic Program! Masters Program: In September the FPMT Masters Program at Istituto Lama Tzong Khapa starts with its third subject, Treasury of Manifest Knowledge (Abhidharmakosha). The Protection Wheel of Vajra Armor practice is now available in downloadable booklet and e-book formats. Versions including both the long and short practices and with just the short practice are available. This practice is especially powerful to cure diseases such as cancer and to remove spirit harm and other hindrances. If one practices it every day and uses the mantra to bless water, the water can be taken by oneself and also given to others. Short practice translated by Lama Zopa Rinpoche and Thubten Pemba; long practice composed by Lama Zopa Rinpoche. We are happy to announce that Mandala‘s October-December 2011 issue is printed and in the mail. 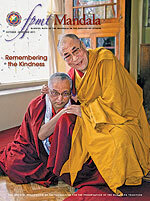 Included in this issue: a feature story called Remembering the Kindness of His Holiness the Dalai Lama and the Courageous People of Tibet and a tribute to Kopan’s Khensur Rinpoche Lama Lhundrup in honor of his 40 years of compassionate contributions to FPMT and the spread of Dharma around the world. (Both of these articles feature additional content available on our website.) This issue’s entire online content is now freely available on fpmt.org/mandala and not to be missed! This issue’s online articles cover many topical and timely issues and are fully translatable in 21 languages via Google Translate. Additionally, we’ve launched two new photo galleries including an extensive compilation of FPMT News Around the World photos. If your center, project or service is considering creating or updating its altar, please look at these photos of altars which Lama Zopa Rinpoche has indicated are examples of good altar design. Khensur Rinpoche Lama Lhundrup Rigsel, Kopan Monastery, Nepal, March 2011. Photo courtesy of Jo Hathaway. At 11:10 p.m. (Nepal time) on September 7, 2011 (the auspicious 10th day of the Tibetan calendar), Khensur Rinpoche Lama Lhundrup passed away in Kopan Monastery and entered into meditation. At the time, Lama Zopa Rinpoche and all the Kopan monks were doing Heruka Lama Chöpa puja for Khensur Rinpoche Lama Lhundrup. He will be missed by all at Kopan Monastery and Nunnery, and by the numerous students all over the world that received his untiring advice and guidance over the past 40 years. Lama Zopa Rinpoche requested all FPMT centers, projects, services and students to please do Medicine Buddha puja (extensive, middle length or brief – whatever can be managed). 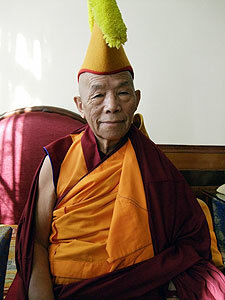 Please visit this new page to keep updated and read more about Khensur Rinpoche Lama Lhundrup. His Eminence Trulshik Rinpoche, head of the Nyingma tradition and one of Lama Zopa Rinpoche’s gurus, passed away on September 2, 2011, and finished his final meditation three days later. Gendun Drubpa in Canada, started as a study group in 2006, has just affiliated with FPMT, Inc. and become a center – congratulations! “On August 6 Chag-tong Chen-tong (CTCT) offered a most beautiful afternoon tea and welcomed visiting Sangha – Australian Vietnamese monk Ven. Thong Phup and Ven. Karma Sonam Palmo – to join us on this day. SPC Sandra gave an overview of the International Mahayana Institute (IMI) and the benefit of the Sangha community and then CTCT offered thanks and offerings to each Sangha member and we shared a delicious extended afternoon tea time together. 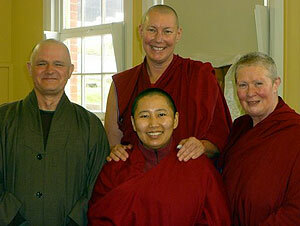 It was wonderful to have visiting Sangha teaching right at that moment too! This was on the last teaching day of week five of Buddhism in a Nutshell that FPMT-registered teacher Ven. Tenzin Chogkyi was presenting at CTCT (which was well attended by 25-30 new and old students). Vajrapani Institute, USA is looking for a Community Relations Coordinator – plus other opportunities!